MachineGames are still masters of first-person violence, but this return to Castle Wolfenstein doesn't give them anything new to work with. What Is It? Standalone prequel to The New Order. A standalone prequel to last year's excellent Wolfenstein: The New Order, The Old Blood marks a return to the classic shooter's traditional ideas, environments and plot beats. It's a strange creative shift. The New Order proved that it was possible to separate B.J. Blazkowicz from Castle Wolfenstein and still create something that felt like a Wolfenstein game. I admired it as much for its idiosyncrasy as its gunplay: it's a game of surprising heart, staggering violence and stylistic originality. It traded techno-gothic Nazi fortresses for retro-futuristic Nazi moonbases and was better off for it. The Old Blood is far more familiar. It's set in 1946, involves both a return to and an escape from Castle Wolfenstein, and plays out the consequences of Nazi occultism in a manner that will feel eerily familiar to anybody who has played Return to Castle Wolfenstein or Raven's 2009 reboot of the series. Even as a fan—perhaps because I'm a fan—I was happy to see the series move away from gothic castles and gunfights in crypts. Yet here we (and they) are. MachineGames' particular sense of style has survived, however. The new Castle Wolfenstein is lovely to look at, a brutal marriage of Helm's Deep and Half Life 2's Citadel. B.J. regards it, the regime that occupies it, and everything that happens within it with the same mixture of folksy wisdom and barely-constrained rage that made his reinvention in The New Order such a surprising success. Your scenery-chewing Nazi foes retain their fondness for Tarantinoish monologuing and in-your-face physical threat, something that MachineGames remain particularly good at evoking in the first person. The script veers from darkly funny to utterly deadpan in a way that implies the intelligence working away under Wolfenstein's implacably dumb exterior. That said, what was novel a year ago isn't necessarily novel now. Nothing in The Old Blood exceeds what was achieved in The New Order, and there are moments when the two are uncannily similar. There's even a bit where you're confronted by a senior female Nazi while carrying a wobbly tray of drinks. This is clearly deliberate, but now doesn't feel like the time for Wolfenstein to put out a greatest hits album: it only just made a case for its continued relevance. Despite the skill involved in The Old Blood's execution, it's disappointing to be confronted with so much familiarity after last year's flood of original ideas. These are still good tricks, but they're the same tricks. The Old Blood shares The New Order's impactful gunplay but lacks its predecessor's pace and variety. A forced stealth section near the beginning lasts long enough to become irritating; what follows alternates between running gunfights, open-ended arena encounters and defense sequences with little escalation. Its high points are, as before, the moments when it lets you take on a room full of Nazis as loudly or quietly as you please. The way Wolfenstein seamlessly transitions between stealth and deafening violence is still its best trick. For every arena that makes the most of that freedom, however, there's another that is too small, too linear or too prescriptive to really deliver. Then there the low points: on-rails turret bits, bullet-sponge enemies, a fiddly vehicle section. The introduction of the supernatural doesn't add anything that you haven't encountered in a hundred other shooters, including more than one prior Wolfenstein game. The final boss marks The Old Blood's lowest ebb, a healthbar-whittling chore that lacks the visual ingenuity and environmental puzzle-solving of its counterparts in The New Order. There are new weapons, but the majority of these are reverse-engineered versions of guns from the previous game, downgraded to match the '40s setting. The sawn-off shotgun is gratifying to use, however, and a new grenade-launching pistol provides you with a room-clearing panic button mitigated by limited ammunition. The campaign took me around four and a half hours to complete on the second-hardest setting, with about 50% of the game's hidden collectibles picked up along the way—completionists are likely to get a few more hours out of it. There's also a score attack mode that allows you to replay certain arena combat encounters from the campaign in order to compete on global leaderboards. This is a welcome addition, one that I'd like to see fleshed out in future Wolfenstein games: it makes the most of the game's excellent-feeling guns, and offers a way back into raw combat for those unwilling to sit through the cutscenes and stealth sections again. 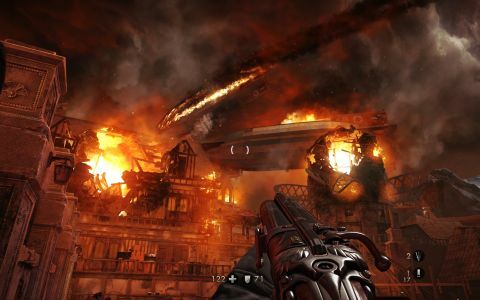 The Old Blood is a false start for Wolfenstein's life after The New Order, a creative step backwards that survives primarily because of the strong groundwork laid in the previous game. It will always be fun to fire these guns and MachineGames's presentation is still ahead of the curve, but this isn't the game you should play if you want to explore those qualities—that game was released a year ago.